Discover another side to Singapore’s famous Orchard Road as a new heritage trail holds a clue to its past. 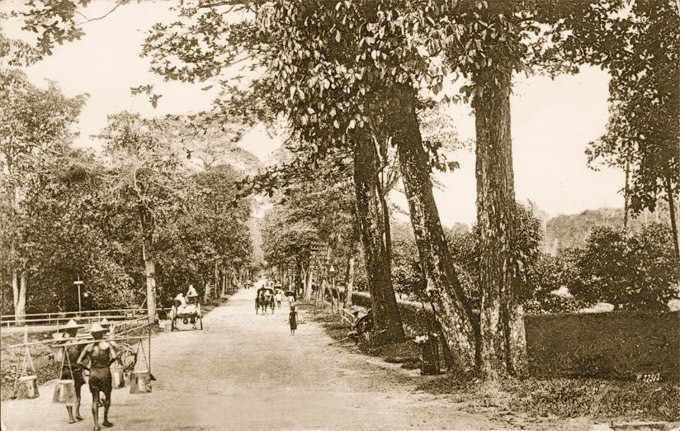 Prior to its transformation into a bustling shopping district, the Orchard area was a valley flanked by the hills of Emerald and Cairnhill amongst others. It provided fertile land for plantations and orchards growing economic crops such as nutmeg and housed cemetery grounds to bury the departed. Many Singaporeans may not know much about the many different aspects of the area’s history. However, the Orchard Heritage Trail is set to change that. The new Orchard Heritage Trail is the 18th heritage trail by Singapore’s National Heritage Board (NHB). It charts Orchard’s metamorphosis into the heart of Singapore’s tourism and retail scene, through its long-standing iconic landmarks, and tales of the communities that lived and worked there over the years. In fact, many firsts for Singapore happened in the Orchard area, including Singapore’s first supermarket, Cold Storage, which remains at its original location at Centrepoint Shopping Centre, and also the first public swimming pool by YMCA at Fort Canning. The trail also includes six National Monuments and a UNESCO World Heritage Site. As with all of NHB’s heritage trails, the Orchard Heritage Trail is a self-guided trail which features 71 heritage sites that dot the Orchard area spanning from Dhoby Ghaut to Tanglin. The trail features 10 trail markers (six of which have been installed, with four more to be installed over time), which provide fascinating insights into Orchard Road’s history, and lesser known facts about the precinct. The trail covers various landmarks, such as former residences of early pioneers such as Lim Boon Keng and Tan Yeok Nee who left an indelible mark on the development of the area, and the places of worship that were built as different communities flourished in the area. It also feature the stories of various communities including the Chinese, Malay, Indians and Jews settled in the Orchard Road area during the 1800s. Some notable community groups included the Indian washermen (or dhobies) after whom Dhoby Ghaut was named; the Teochew community who resided in Orchard’s own kampong, Kampong Teochew and the Peranakans at Emerald Hill. While the trail itself will prove fascinating, the research which went into it was even more intriguing. As part of its research, NHB gathered personal memories and photographs from former and current residents and regular visitors of the area. An open call was conducted through Facebook, which attracted stories and memories from Singaporeans from all walks of life. These accounts reveal little-known stories of spaces, such as a fruit orchard that used to exist next to the Thai Embassy, the old wet market between Koek Road and Cuppage Road, and insights into the everyday lives of the Peranakan community on Emerald Hill from the mid-1990s. For the trail, NHB has launched three thematic routes for easy exploration of its history, people and green spaces. “Orchard Road’s Historical Gems” (40 minutes on foot, 30 minutes on foot and bus) brings visitors around the historical landmarks along Orchard Road. It presents the legacies of the communities who lived and worked at the area long before it became a street known for its shopping malls. Some sites include widely recognised buildings such as Singapore’s first department store C K Tang, Goodwood Park Hotel, which is a National Monument that was built in 1900 as a German social club, and The Heeren, site of the former mixed-use Heeren Building. “Communities and Cemeteries” (1 hour 15 minutes on foot) explores places of worship, schools, homes, community organisations and cemeteries. This route includes the only mosque on Orchard Road – Masjid Al-Falah, as well as Sian Teck Tng, a century-old Buddhist temple and former women’s home. “From Orchard to Garden” (2 hours on foot, 1 hour 30 minutes on foot and bus) is designed for nature lovers. This route takes visitors to the various green spaces that exist or used to exist within the Orchard area, including the Butterfly Trail @ Orchard and Singapore’s first UNESCO World Heritage Site, the Singapore Botanic Gardens. Visitors can download the Orchard Heritage Trail companion guide and map (the latter is available in four languages – English, Mandarin, Malay and Tamil) from Roots.sg. Printed copies of these will also be available at NHB museums and heritage institutions, as well as the Singapore Visitor Centre at Orchard Gateway. There are currently no comments on TALES & TRADITIONS. Perhaps you would like to add one of your own?